Up until last week I’d never really understood what the big deal was about sourdough bread. Whilst I like to think of myself as a relatively proficient baker, sourdoughs are something I’ve never even begun to contemplate making, mainly due to my lack of knowledge on the subject. 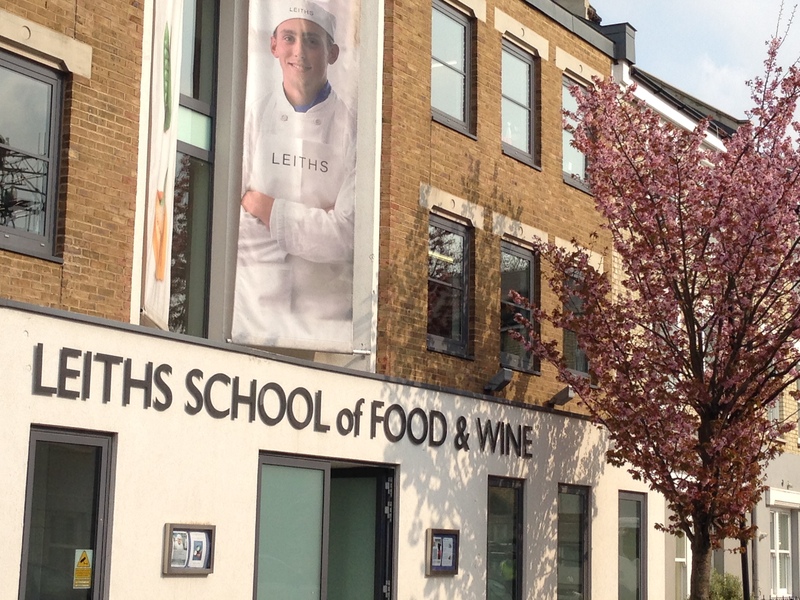 But, all that changed when I attended the Leiths School of Food and Wine “Two Day Introduction to Italian Sourdoughs” run by sourdough guru Hilary Cacchio. The perfect opportunity to satisfy my curiosity and learn some new baking skills. And what a lot I learnt! 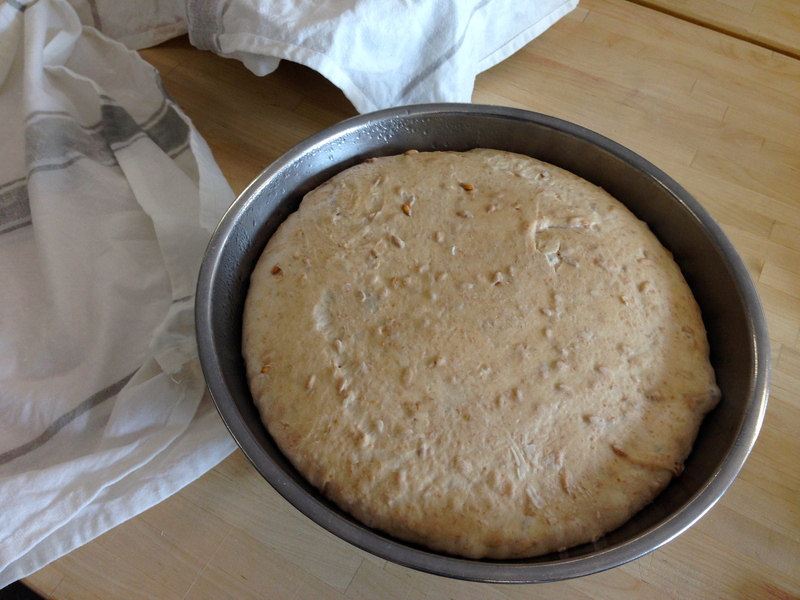 The dough before it’s 30 minutes rest – potatoes, spelt and 500g flour added. Gripping stuff and completely and utterly fascinating I’m sure you’ll agree! Well, the Perky Kebab sadly didn’t. Mid way through my excited monologue on these very topics, I noticed his eyes starting to glaze over. Pah, philistine, I thought. Then the same thing happened with my parents. And a couple of friends. And then I realised I had, in the space of 2 days, turned into a baking bore. 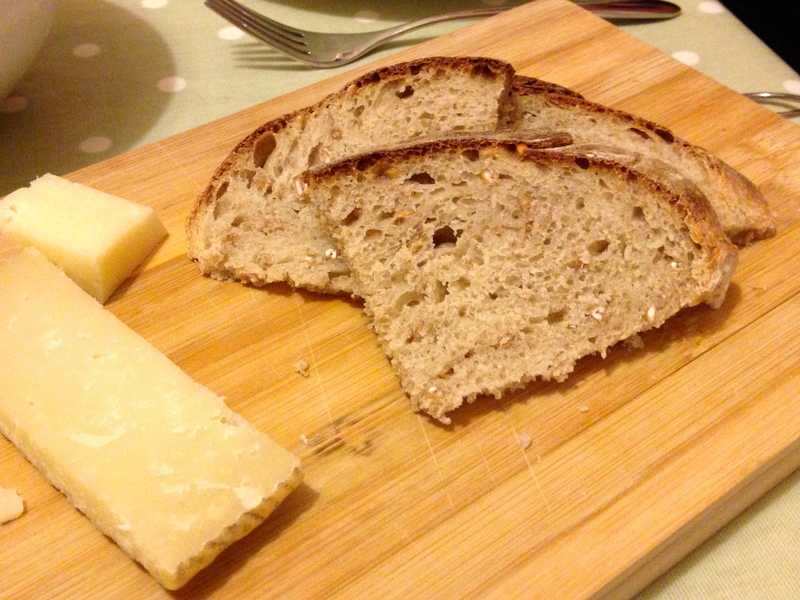 So I shall spare you the dissertation on why you should embrace sourdough bread and instead focus on making my argument using one of my favourite recipes from the course: Hilary Cacchio’s Pane Montanaro – translated as a spelt and potato bread. This bread completely blows all other breads out of the water. The Perky Kebab said it reminded him of bread from his childhood in Greece – proper village bakery stuff. It’s that tasty. It can happily be eaten on it’s own with nothing but a drizzle of olive oil. But it also makes a wonderful loaf for a sandwich. The crumb is soft but slightly chewy so it holds it own well and can be piled high with all manner of delicious-ness with no risk of crumbling or sogginess. 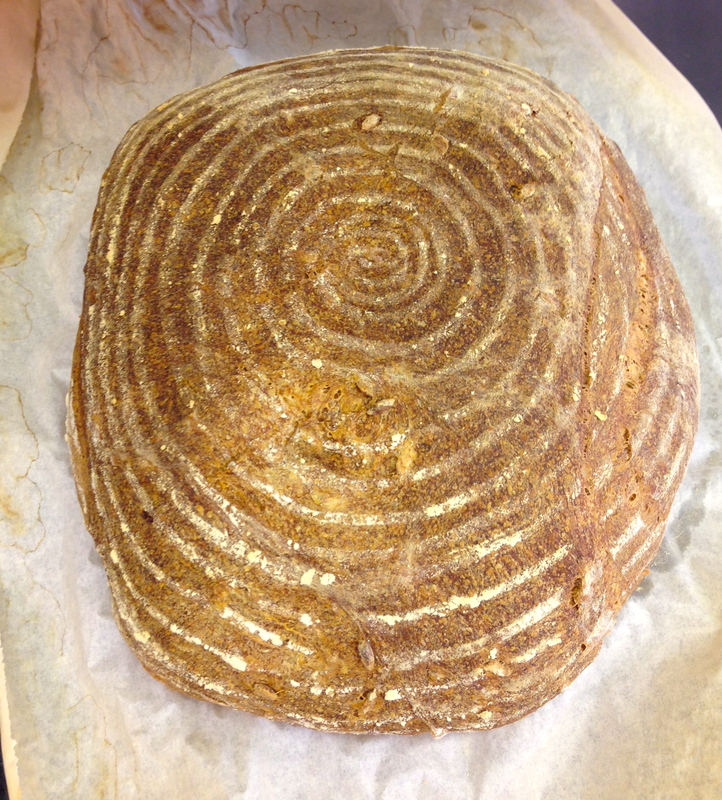 The spelt grains give great texture and delicious nutty flavour. And it also lasts for a good few days – perhaps thanks to the potato giving added moisture? If you’re familiar with sourdoughs you’ll know that they’re not going to give you instant gratification. Assuming you have a starter culture up and running (see Hugh Fearnley-Whittingstall’s great guide to making one), this bread still takes around than 24 hours to make. But don’t let that put you off! I’m not talking actual hands-on baking time, but time to allow your sourdough to ferment/rise and then prove, becoming super delicious and tasty all the while. But if you want to enjoy a fantastic loaf of bread, this is definitely one to try. 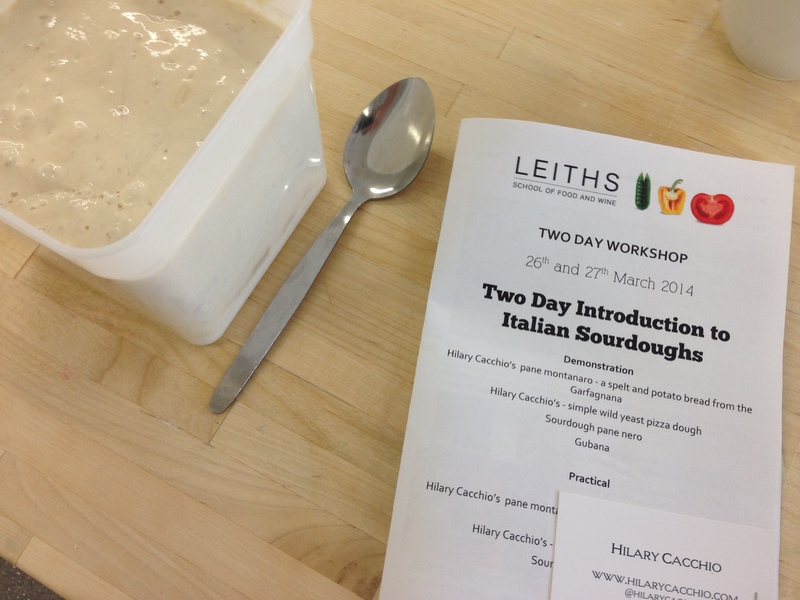 And if you’re lucky it might even turn you into as much of a sourdough geek as I’ve become! Mix everything together in a bowl – it will resemble thick porridge. Cover the bowl loosely with a cloth and leave at room temperature for 6-8 hours – the sponge will rise up and develop big bubbles. 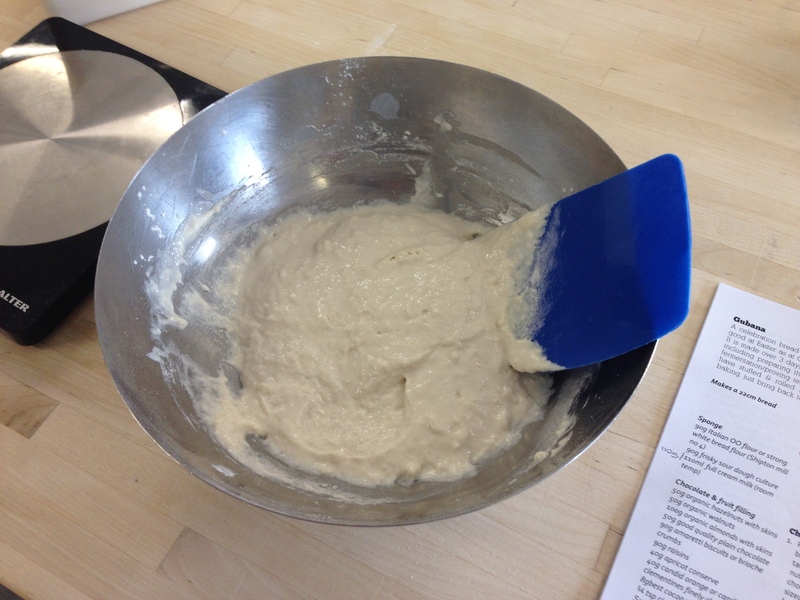 Stir in the flour into the initial sponge and form a stiff sticky ball. Cover again and place in the fridge for 8-12 hours, where it will continue to inflate. Put the spelt/faro in a small bowl, cover with water and leave to soak for 8-12 hours. Cook the potatoes in water until tender. Retaining 220-230ml of the cooking liquid, drain the potatoes and crush them roughly. Allow to cool in the retained cooking liquid. Bring the sponge back to room temperature then add the potatoes, drained spelt grains, flour and salt. Mix in and knead for about 4 minutes until everything is incorporated. Cover and rest for 30 minutes. Knead for a further 4 minutes until you have a smooth elastic dough. If it feels a little dry, add extra water now (it shouldn’t be too sticky though). Rest for 15 minutes. Knead for another 4 minutes and rest for 15 minutes. 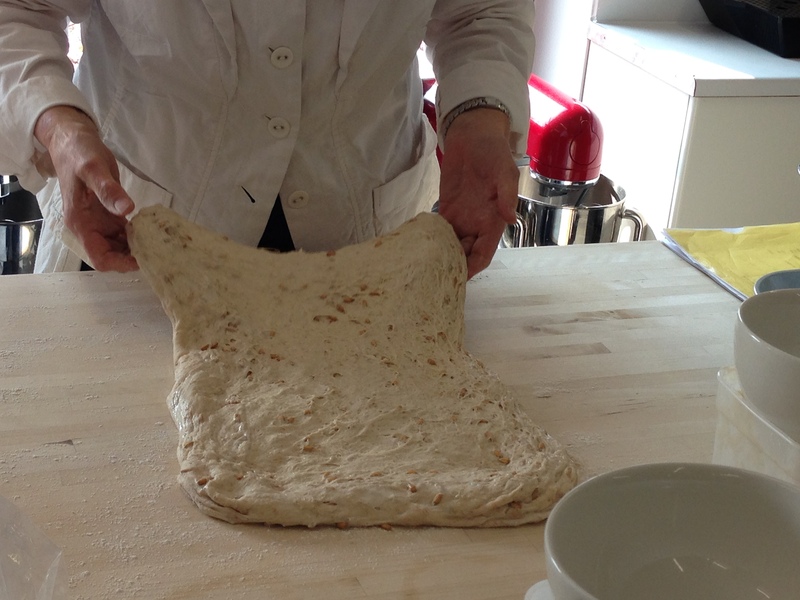 Check to see how stretchy your dough is – you should be able to stretch it out quite far without it breaking. 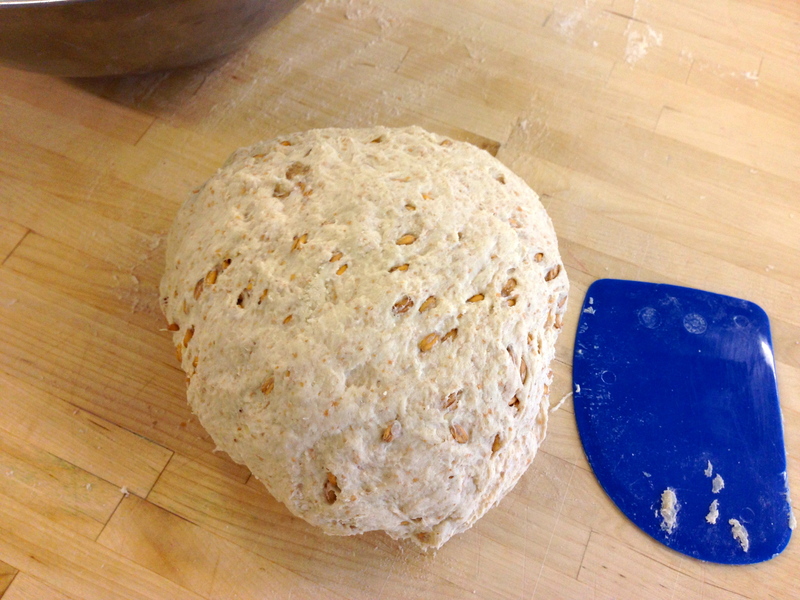 If it breaks easily, knead for a little longer until stretchy and smooth. Place in a bowl, cover with a damp cloth and leave in a cool place (not the fridge though unless it’s high summer) overnight until it almost trebles in size. Flour the work surface a little and gently scrape the dough out of the bowl. Pull it into a rectangle about A4 in size, fold the top third down and the bottom third up, then fold one third from the right and one third from the left to form into a squarish ball. 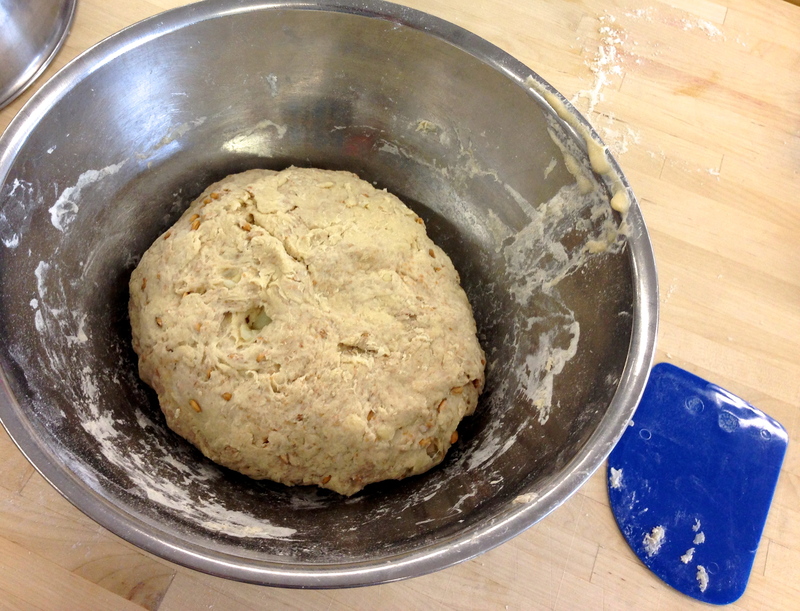 Gently shape the dough into a ball, without knocking too much air out. Place onto a baking tray, cover loosely with oiled cling film and leave at room temperature for a couple of hours to double in size. Preheat the oven to 250°c/230°c fan. 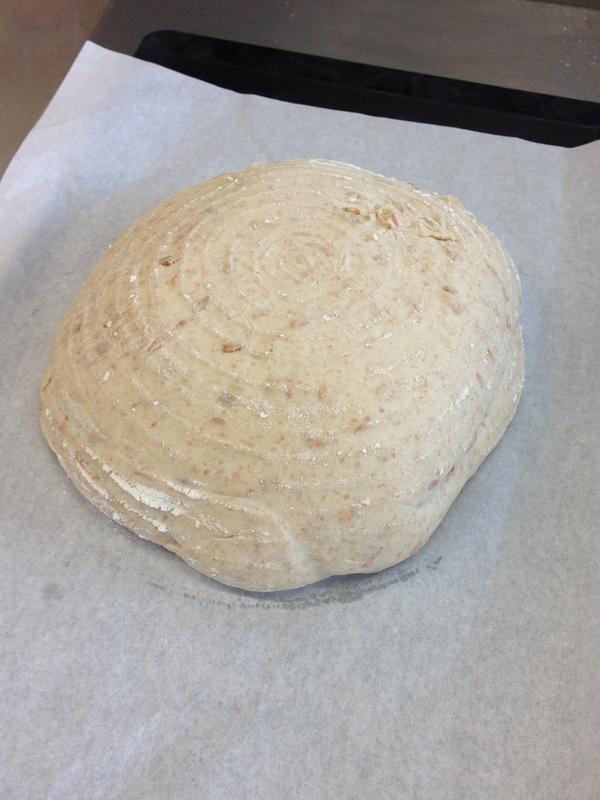 When the dough is ready to go into the oven, empty a cup of water into the bottom of the oven and put your loaf in. Cook for 10 minutes then turn down the temperature to 200°c/180°c fan and cook for 30-35 minutes until the crust is deep brown and the bottom sounds hollow when you tap it. Leave to cool on a wire rack. P.S. You don’t have to stick to the timings too rigourously above – if you cut down time in a couple of stages you just need to add on in others e.g. I cut the sponge fermentation down to about 4 hours, the fermentation after the first feed to about 6, but then left the dough for about 18 hours before cooking in the oven, with no detrimental effects as far as I could see.